Though the recent West Coast ports crisis has officially ended, the event highlights the need for manufacturers and distributors to take a hard look at their supply chains and determine how they can prevent future disruptions. The weeks-long port strike officially ended on Saturday, February 21st, however major congestion is expected for another six to eight weeks. According to the Pacific Maritime Association’s annual report, as noted by Bloomberg, West Coast ports play an integral role in the U.S. economy as they are responsible for more than 43% of trade in the nation. As could be expected, the crisis led to numerous logistical issues in the United States and abroad. California orange growers were already under pressure as unusual weather caused the fruit to ripen a month early. Adding a shipping roadblock to the mix only made the problem worse, as more than a quarter of the oranges grown were meant to be exported to Asia. And unlike durable goods, produce cannot sit in a warehouse for long before spoiling – leading to lost profits for growers and lost product for overseas distributors. So what can be done to remedy or prevent situations like this from happening in the future? As a business owner or supply chain professional, the number one recommendation is to ensure that as many products as possible are manufactured and sold among North American businesses. By localizing your supply chain, you can avoid the complications associated with international shipping. 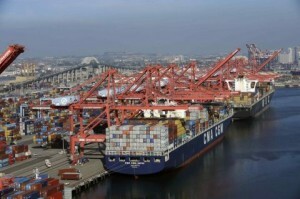 Many of our clients were largely immune to the ports crisis thanks to our commitment to American manufacturing. At Bunting Bearings, all of our metal products are made here in the United States, allowing our customers to continue running their businesses as usual without having to worry about parts being stuck overseas or on the cargo ships held off California. We are proud to be a supplier of American made metal products, and look forward to discussing how our bearings and cast materials can improve your product performance.